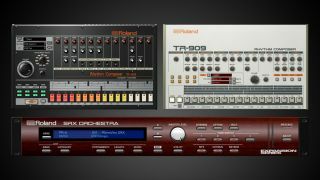 NAMM 2018: It feels like pretty much every music software developer and their dogs have released TR-909 and TR-808 drum machine emulations at some point over the past couple of decades, but now Roland, creator of the original hardware, is doing the same. Before you get too excited - if, indeed, you do find this exciting - we should say that these form part of Roland’s Cloud Service, so you’ll need to sign up to that if you want to use them. These new emulations operate as VST and AU plugins on PC and Mac, and are based on detailed circuit analysis and “obsessive attention to the interactions and dynamic behaviour of the analogue circuitry”. Roland, of course, has emulated its famous TR units various times in hardware, most recently as part of its Boutique range. Also heading up to the Cloud is SRX Orchestra, a recreation of the orchestral expansion that was released for the Roland JV-1080 module in the ‘90s. You can find out more and subscribe on the Roland Cloud website, though the new plugins won't be available until February or March.